Playing in the dirt with your children can yield a bumper crop of benefits! Spring weather can be unpredictable, but there is one thing you can count on: more hours of sunlight each day. 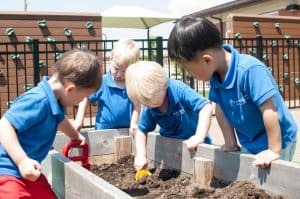 And, according to the child care experts at Kiddie Academy, that makes April and May great months for families to begin planning – and planting – the seeds of a summertime garden. Children of all ages can participate in some aspect of gardening. As you plant seeds inside now for transplant outdoors later, toddlers can help to poke seeds into the soil, or water plants. Older children can help with transplanting, weeding and harvesting. Whether you plant vegetables or flowers or both, your garden will provide valuable life lessons for your children while producing beautiful and tasty results that everyone can take pride in and enjoy. What makes gardening with your children such a worthwhile activity? – reinforces the importance of healthy eating and teaches children where food originates. – teaches your children basic science lessons like cause and effect, and plant life cycles. – provides character education lessons about caring for the environment. – fuels your child’s creativity as they plan what to plant and envision the final result. – gives your children permission to do something they love to do: play in the dirt and explore nature. While geography and plant selection are the key factors in the decision on when to begin to plant your outdoor garden, starting plants indoors from seeds is a great way to show children the entire cycle of planting. When you do begin your outdoor planting, keep in mind that children may not have the patience to wait for seedlings to produce results, so consider adding a few more mature plants from your local nursery to your garden for some “instant” gratification. The Old Farmer’s Almanac offers a planting calendar based on the “frost free” date for your location. 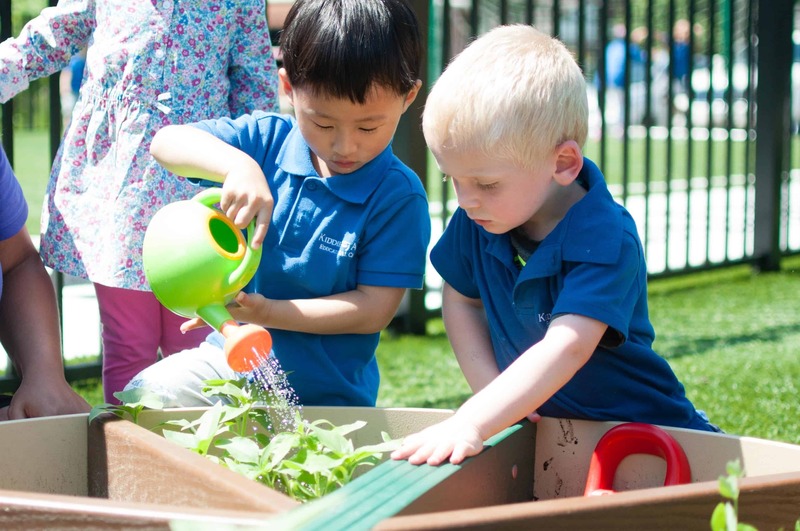 Our guide, Kiddie Academy Spring Seedlings Cheat Sheet, suggests the best spring seedlings to plant that will result in a bountiful harvest, but also sustain your child’s interest from planting to picking. – Enjoy watching the many phases of plant development; each day will bring a new discovery. – Support your young gardeners’ efforts and help them celebrate Earth Day on April 22 by showing off the garden’s progress to family and friends, or hosting a mini-garden tour featuring snacks harvested on-the-spot. – Finally, plan for success. Sunflowers, lettuces and pumpkins are all relatively easy to grow, are hardy, and children can eat the final product. Just be sure you have enough space set aside. Sweet peas, marigolds and pansies are also good choices for kids to plant, as these flowers grow easily and abundantly.